The markings described above are on the tire in addition to the tire name (sales designation) and the manufacturer's name. Height-width ratio: aspect ratio 2 is the size ratio between the tire height and tire width and is shown in percent. The aspect ratio is calculated by dividing the tire width by the tire height. Load-bearing index: load-bearing index 5 is a numerical code that specifies the maximum load-bearing capacity of a tire. Example: Load-bearing index 91 indicates a maximum load of 1,356 lb (615 kg) that the tires can bear. For further information on the maximum tire load in kilograms and lbs, see . • Optionally, tires with a maximum speed of over 149 mph (240 km/h) may have "ZR" in the size description, depending on the manufacturer (e.g. 245/40 ZR18). Example: 245/40 ZR18 97 Y. In this example, "97 Y" is the service specification. 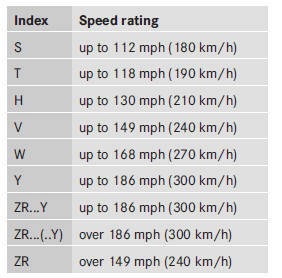 The letter "Y" represents the speed rating. The maximum speed of the tire is limited to 186 mph (300 km/h). • The size description for all tires with maximum speeds of over 186 mph (300 km/h) must include "ZR", and the service specification must be given in parentheses. Example: 275/40 ZR 18 (99 Y). Speed rating "(Y)" indicates that the maximum speed of the tire is over 186 mph (300 km/h). Ask the tire manufacturer about the maximum speed. the tire wall. Tires with this marking fulfill the requirements of the Rubber Manufacturers Association (RMA) and the Rubber Association of Canada (RAC) regarding the tire traction on snow. They have been especially developed for driving on snow. In addition to the load bearing index, load index 1 may be imprinted after the letters that identify the speed index 6 on the sidewall of the tire . U.S. tire regulations prescribe that every tire manufacturer or retreader must imprint a TIN in or on the sidewall of every tire produced. The TIN is a unique identification number. The TIN enables the tire manufacturers or retreaders to inform purchasers of recalls and other safety-relevant matters. It makes it possible for the purchaser to easily identify the affected tires. Manufacturer identification code: manufacturer identification code 2 provides details on the tire manufacturer. New tires have a code with two symbols. Retreaded tires have a code with four symbols. For further information about retreaded tires, see . This information describes the type of tire cord and the number of layers in sidewall 1 and under tire tread 2. Describes the number of plies or the number of layers of rubber-coated fabric in the tire tread and sidewall. These are made of steel, nylon, polyester and other materials. Metric unit for tire pressure. 14.5038 pounds per square inch (psi) and 100 kilopascals (kPa) are the equivalent of 1 bar. DOT marked tires fulfill the requirements of the United States Department of Transportation. The number of occupants which the vehicle is designed for, multiplied by 68 kilograms (150 lb). A uniform standard to grade the quality of tires with regards to tread quality, tire traction and temperature characteristics. Ratings are determined by tire manufacturers using U.S.
government testing procedures. The ratings are molded into the sidewall of the tire. The recommended tire pressure applies to the tires mounted at the factory. The Tire and Loading Information placard contains the recommended tire pressures for cold tires on a fully loaded vehicle and for the maximum permissible vehicle speed. This is the combined weight of all standard and optional equipment available for the vehicle, regardless of whether it is actually installed on the vehicle or not. This is the part of the wheel on which the tire is mounted. The GAWR is the maximum gross axle weight rating. The actual load on an axle must never exceed the gross axle weight rating. The gross axle weight rating can be found on the vehicle identification plate on the B-pillar on the driver's side. The speed rating is part of the tire identification. It specifies the speed range for which the tire is approved. The GTW is the weight of a trailer including the weight of the load, luggage, accessories etc. on the trailer. The gross vehicle weight includes the weight of the vehicle including fuel, tools, the spare wheel, accessories installed, occupants, luggage and the drawbar noseweight, if applicable. The gross vehicle weight must not exceed the gross vehicle weight rating GVWR as specified on the vehicle identification plate on the B-pillar on the driver's side. The GVWR is the maximum permissible gross weight of a fully loaded vehicle (the weight of the vehicle including all accessories, occupants, fuel, luggage and the drawbar noseweight, if applicable). The gross vehicle weight rating is specified on the vehicle identification plate on the B-pillar on the driver's side. Metric unit for tire pressure. 6.9 kPa corresponds to 1 psi. Another unit for tire pressure is bar. There are 100 kilopascals (kPa) to 1 bar. In addition to the load-bearing index, the load index may also be imprinted on the sidewall of the tire. This specifies the load-bearing capacity more precisely. The weight of a vehicle with standard equipment including the maximum capacity of fuel, oil and coolant. It also includes the airconditioning system and optional equipment if these are installed in the vehicle, but does not include passengers or luggage. The maximum tire load is the maximum permissible weight in kilograms or lbs for which a tire is approved. Maximum permissible tire pressure for one tire. Maximum load on one tire. This is calculated by dividing the maximum axle load of one axle by two. A standard unit of measure for tire pressure. Relationship between tire height and tire width in percent. This is pressure inside the tire applying an outward force to each square inch of the tire's surface. The tire pressure is specified in pounds per square inch (psi), in kilopascal (kPa) or in bar. The tire pressure should only be corrected when the tires are cold. The part of the tire that comes into contact with the road. The tire bead ensures that the tire sits securely on the wheel. There are several steel wires in the bead to prevent the tire from coming loose from the wheel rim. The part of the tire between the tread and the bead. The combined weight of those optional extras that weigh more than the replaced standard parts and more than 2.3 kilograms (5 lbs). These optional extras, such as highperformance brakes, level control, a roof rack or a high-performance battery, are not included in the curb weight and the weight of the accessories. This is a unique identifier which can be used by a tire manufacturer to identify tires, for example for a product recall, and thus identify the purchasers. The TIN is made up of the manufacturer's identity code, tire size, tire type code and the manufacturing date. The load bearing index (also load index) is a code that contains the maximum load bearing capacity of a tire. Traction is the result of friction between the tires and the road surface. The TWR specifies the maximum permissible weight that the ball coupling of the trailer tow hitch can support. Narrow bars (tread wear bars) that are distributed over the tire tread. If the tire tread is level with the bars, the wear limit of á in (1.6 mm) has been reached. The distribution of occupants in a vehicle at their designated seating positions. Rated cargo and luggage load plus 68 kilograms (150 lb) multiplied by the number of seats in the vehicle.